A small island in the Pacific, and indeed the most remote inhabited speck of land that there is on Earth, which makes it one of those ultimate middle-of-nowhere travel destinations. 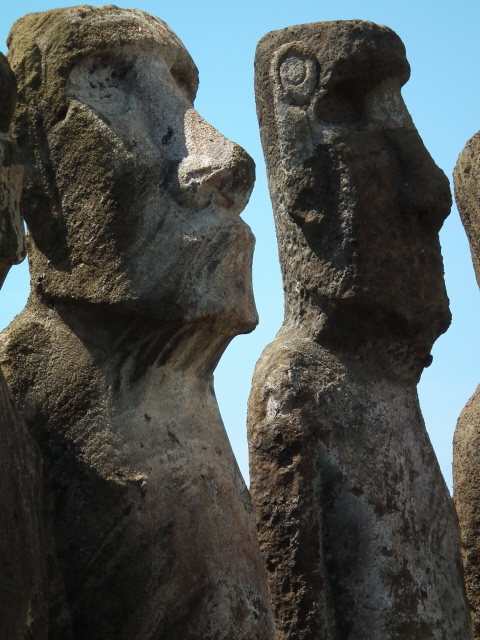 The island, which these days "belongs to" Chile, is most famous, however, for its mysterious stone statues called moai. And these partly tell a very dark tale too – one of environmental destruction leading to complete societal collapse and a civil war that even involved cannibalism. More background info: Easter Island is so called because the first European explorer, Dutchman Jacob Roggeveen, to set his eyes on it did so on Easter Sunday 1722. The Spanish name of the island, Isla de Pascua, follows the same pattern. Locally, however, the island's "correct" name is Rapa Nui (two words) – and the islanders refer to themselves, as to their language, as Rapanui (one word). It's a subtropical piece of rock, created by three (now extinct) volcanoes whose lava created a land mass of roughly triangular shape. It's a small land mass: only 66 square miles (177 km2), with the longest stretch of coastline being 15 miles (24 km), and the widest point being 7.5 miles (12 km). It's mostly barren. Looking at this desolate speck of land in the ocean you wouldn't expect anybody to live there – let alone expect to find vestiges of one of human history's most unlikely high cultures. Volumes have been written about the island's unique archaeology and its people's mysterious history. This is not the place for a detailed account, so only a short recap has to do – I'm basing this mostly on the Easter Island Chapter in Jared Diamond's "Collapse" (2005:79-119). Exact dates and figures are disputed but it seems to be more or less agreed these days that the settlers of Easter Island must have arrived at some point around the year 900 as part of the easternmost expansion of the Polynesians (i.e. older theories that claimed they were not Polynesians but had come from South America have long been proven wrong). Their society was composed of about a dozen or so clans who shared out the land and coast more or less evenly, and overall society was hierarchically structured roughly falling into two classes: commoners (peasants and labourers) and an elite that held political and economical power. So far nothing unusual. The moai were erected apparently for reasons that represent a mixture of symbolically securing the elite's positions of power and as part of a kind of ancestor-worship religion (but then again that's nothing unusual either – when has organized religion ever not been intertwined with political power?). In principle the tradition of erecting such stone figures had already been common practice in other parts of Polynesia too. But only on Easter Island did it go to such extremes that left us with those awesome giants. Why and how did they do it? The early European explorers noted that the islanders they encountered lived on a treeless island and had no proper tools – not even boats large enough for more than coastal fishing. The latter is also why the explorers wondered how the islanders' ancestors could ever got here in the first place, but the answer to that is simple: they arrived on large boats built at the place of origin (further west, e.g. the Marquesas or Tahiti). But how could they support life AND erect such monumental statues without even timber for transport and fuel. Answer: they did once have trees – but they used them all up. Like almost everything else. The population of Easter Island is estimated to have peaked (read: overpopulation was at its worst) at perhaps 15,000 – a lot for a tiny island of only 66 square miles. Agriculture was already tricky, given the island's location and exposure to erosion. But the island WAS once covered with trees – including exceptionally large species of palm trees. One by one, these were "used", i.e. cut down, exploited for building material (allowing for the construction of large boats too) and certainly also in the erection of those moai. But they overdid it – to the max. Moreover, all species of animals were soon hunted down to extinction, leaving only chicken as livestock and fish to fish in the surrounding ocean (as long as proper boats allowed for it). Agriculture was highly organized to extract maximum crops, straining the soil. As resources got scarcer and tensions arose accordingly between clans as well as within the various clans, they didn't slow down the exploitation … no, they stepped it up! Those clinging on to power eventually had increasing difficulties justifying their cushy position – as this was based, as so often, on the tacit, religiously motivated assumption that their special relationship with the deities secured everyone's wellbeing, so that it was deemed perfectly normal that the majority of commoners would work for the privileged minority elite. But when life began getting difficult for everyone as resources ran out, this old order became questionable. To reinforce their power positions symbolically, the clan chiefs had ever larger and larger moai erected, basically in order to "outdo" each other – but their production/erection further accelerated the deforestation of the island. Fittingly, the very largest moai are known to be ones erected last. Why didn't they see that this was madness? In the end, collapse also meant: reduction of the critical overpopulation – not gradually and smoothly, but mostly through death, natural as well as violent. Starvation will have been a major cause of death – but there is also clear evidence of active slaughter and even cannibalism! After all, as other resources ran out, eating each other was one of the last options still available! It may also have had ritualistic elements (literally swallowing up the enemy). But details are unclear. Then came the European explorers and colonizers. And it has to be admitted that this is where the analogy to the modern global situation ends (unless you believe extra-terrestrials are about to land on Earth). These outsiders did what they did all over the Americas and elsewhere: engage in ruthless exploitation themselves. On Rapa Nui the only resource left to exploit was the remaining population. Indeed Peruvian slave traders took a large part of the Rapanui away and sent them to work in mines on the mainland. In addition, contact with the new arrivals brought diseases that the islanders were especially susceptible to, in this case in particular smallpox. Yet, the Rapanui were NOT wiped out completely! At one point their number may have been down to as few as a hundred or so – but they did survive. The island was annexed by Chile in 1888, which used it to graze sheep, mainly, as sheep could still get something out of Rapa Nui's meagre grassland and shrubs. But the Rapanui population slowly recovered somewhat too, and even their Polynesian cultural roots were gradually rediscovered (and especially the birdman cult). It's been a long, slow struggle, but today the islanders' enjoy a somewhat better status than they had for centuries. Land was "given back" to the natives, and the management of the cultural heritage is now also more under islanders' control than before. Guides in the national park have to be Rapanui locals these days. Tourism has become the largest mainstay of the economy. The construction in 1967 of the airport at Hanga Roa, the island's only town, was a major factor fostering this development. The current population of the island, almost all of whom live in Hanga Roa, stands at just under 4000, including Rapanui and (mostly) Chileans who settled here. As the mystery and utter exoticness of Easter Island is major draw for tourists, the tourism infrastructure that has since developed is quite substantial for such a tiny place, including very comfortable accommodation, plenty of restaurants and bars, as well as souvenir shops selling local arts and crafts … miniature moai are, predictably, especially popular. So when you visit the island as a (dark) tourist today, all its dark history remains rather abstract … unless you engage in actual archaeology perhaps. But with a little imagination the whole aura and dark mystique can still be felt by the non-professional visitor too. Otherwise it's simply the feel of extreme remoteness and the ruggedness of the inland terrain that makes for prototypical middle-of-nowhere-tourism. Finally, a note on Easter Island archaeological terminology: the stone statues are called moai, while the ceremonial platforms on which they had been erected are called ahu. They are made of dark-grey-ish volcanic rock mostly quarried at Rano Raroku. The reddish rock of the topknots that some moai are crowned with are called pukao. These were made of softer volcanic scoria, which was mined elsewhere, namely at Puna Pau. Only a few of the moai apparently ever had eye set-ins, which were made of coral – and originally only applied for particular ceremonial occasions. One reconstruction with eyes permanently in place can be found just north of Hanga Roa. What there is to see: Simply being in this most remote spot on the planet makes for an eerie feeling – after five hours of flying over nothing but the empty expanse of the Pacific. You can't help but wonder how it is even possible not to miss this tiny piece of land in the midst of all that nothingness. Well, modern electronic navigation systems is of course the plain and simple answer. Yet, a certain, if rather irrational mystique is exuded by the very "place-ness" of Easter Island's location. But you could just as well admit it: if you're going to this forsaken place what you most want to actually see are those moai, the enigmatic, mystical stone statues that epitomize Easter Island like nothing else and that you, like most people, will have seen pictures of. Standing in front of them for real, though, is indeed something else. A few impressive ones are quite easily accessible on foot, being located on the edge of the island's only village, Hanga Roa. They are to be found just north of the cemetery (which is an interesting sight in itself too, by the way). First there's the archaeological complex called Ahu Tahai, comprising an ancient boat ramp, earth ovens, and Ahu Vai Uri, crowned by a set of five moai, re-erected in 1968, but some showing significant damage. Further north, and past the solitary, more intact moai at Tahai itself, follows Ahu Ko Te Riku – which is probably the most elaborately restored moai of them all … complete with Pukao topknot and coral eye set-ins in place. It almost looks too artificial to be completely believable, so sleekly refurbished does it appear. Still, its stare inland has something particularly captivating and at the same time slightly disturbing. By the way: all original moai erected on ahu were looking away from the ocean, facing inland, overseeing the island and its people! Along the waterfront of Hanga Roa village there are a few more, smaller and less impressive moai/ahu, but to see the most famous specimens you need to get out of town. Before doing so you may want to consider visiting the local museum, called Museo Antropologico Padre Sebastian Englert. It's good for those interested in a bit more prehistoric Polynesian background, archaeology, the tribal make-up of Easter's past society, as well as an account of the island's post-civil-war history and culture, etc. (open Tuesdays to Fridays 9:30 a.m. to 5:30 p.m. and only to 12:30 at weekends, closed Mondays; admission 2 USD, or 1000 CLP). To see the really good bits of Easter's prime attraction of moais, most people go on an organized guided tour, which is a good thing as the guides are native Rapanui citizens, so you also get an impression (which you wouldn't if you went independently) of how the locals view their island's dramatic history and the warning it presents to the rest of the world. The focus will, however, mostly be on plain archaeology. Simply ogling the mysterious moai is what the point is, really. The tour I went on first headed to the east coast of the island to a couple of sets of toppled moai – which is a good reminder that this was the state that all moais were found in when Western colonizers appropriated the island. Not a single one was still left standing at that time. Seeing those once proud effigies lying face-down on the ground, some even broken into two or more pieces, is a good indication of how violently the old culture was rejected during that troubled time when the very existence of any human presence on the island was under acute threat. You can also see simple dwelling caves as well as a few, more or less ruined, "chicken houses" that the islands kept their only livestock in – which therefore was of exceptional value, especially towards the phases when the environment was mostly stripped bare all around them. A highlight on any tour of Easter Island is the massive Ahu Tongariki, where as many as 15 moai have been re-erected. Like all the others they had been toppled by the beginning of the 18th century, and further destruction struck in 1960 through an earthquake-induced tsunami that scattered the ruins even more. But from 1990 to 1996 all 15 were painstakingly restored, together with their huge ahu platform (at nearly 100m / 330 feet the longest of them all). This was largely an initiative by a company from Japan, which brought in large cranes to lift the toppled moai back into an upright position. It gives you an idea what a feat of prehistoric engineering it must have been for the Rapanui to initially erect these massive statues of rock without any such technological help. Today, the row of moai at Tongariki is one of the coolest sights to behold on Easter – also thanks to the most dramatic backdrop of any such site: just beyond the bay they look away from the coast rises to sheer cliffs … and beyond is nothing but the endless ocean. The moai themselves are of varying sizes, including some of the biggest to be found standing anywhere on the island, as well as one of them complete with its red scoria pukao. More of these pukao still lie scattered on the ground beyond the ahu. And in the distance you can see the cone of Rano Raraku volcano. Rano Raraku is arguably the most significant archaeological site on the island: this was the quarry from which virtually all the moai were chiselled, and almost 400 of them, in all stages of un-finished-ness are still in situ here. This includes the largest one ever attempted, a 70 foot (21m) giant, its shape already well discernible, but the body still firmly attached to the bedrock. One has to wonder how the heck this monster could have been transported from here to wherever it was supposed to be erected. You'll see in the photo gallery a T-shirt that one of my fellow travellers was wearing, on which is printed: "The future is in your hands". Nowhere else could that warning have been more poignant than here on Easter Island, and in particular at Rano Raraku! 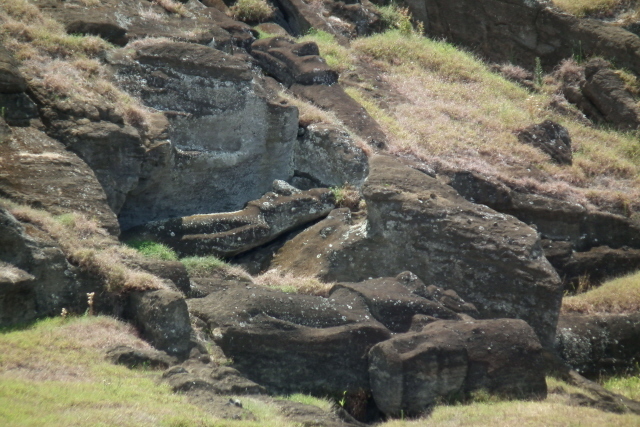 There are several well-designated paths through the cluster of half-buried moai and along the outer hillside of the volcano's eastern flanks – one should not stray off these paths, let alone touch or even climb on any of the moai. In the past that was apparently quite common tourist behaviour, but these days strict rules are in place to protect these unique relics from further damage that such irresponsible behaviour would incur. At the furthest end of the circuit (which is about a mile / 1.5 km in total) stands one of only very few kneeling moai that is thus more than just a torso and even includes visible buttocks. It also appears to have a beard (unlike all other moai). Its exact status remains a mystery. At the south-western side of the volcano's cone a path leads through a lower rim part of the volcano into the crater. The deeper parts of this are filled with a reed-ringed crater lake, but on the inside of the higher eastern rim you can see yet more unfinished moai scattered around. 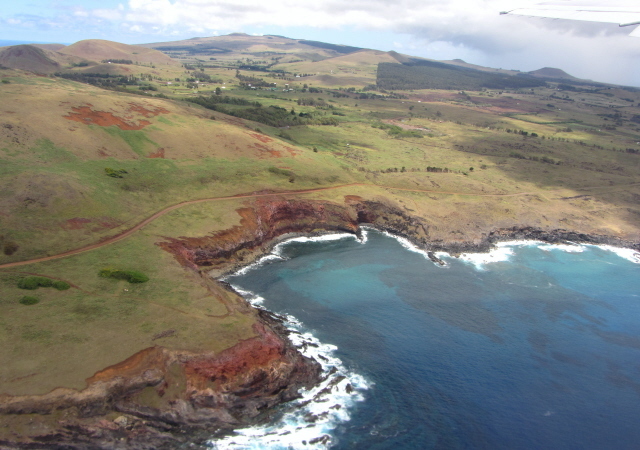 Another site of major importance on Easter Island is Anakena – where the island's only beach is located, thus assumed to have been the only plausible landing stage for the first Polynesian settlers arriving here. The palm trees behind the beach are all recently planted though, and thus out of keeping with the rest of the island's deforested, barren appearance. Also at Anakena is the particularly remarkable Ahu Nau Nau, which features a row of moai, four of which have their red pukao in place (in two different styles, with or without a central knob on top). 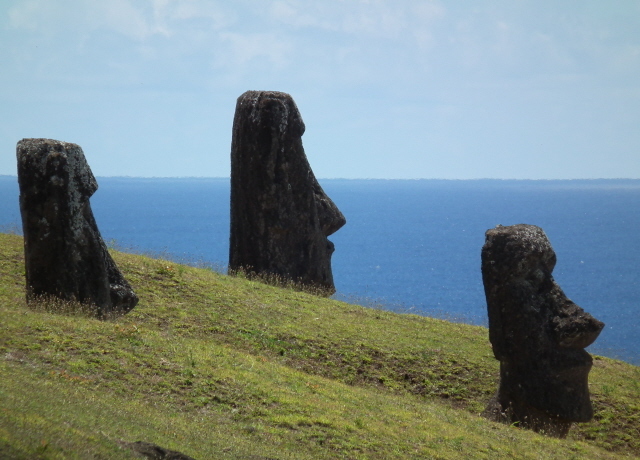 It's certainly one of the most iconic sights on Rapa Nui! There are many more ahu / moai sites along Easter Island's coast, including the late-toppled 10m (30 foot) giant of Ahu Te Pito Kura, which is estimated to weigh over 80 tons. Various ahu sites are genuine archaeological sites, where digs are ongoing, and thus unsuitable for ordinary tourists. Back in Hanga Roa village, a couple of sights are potentially worth a brief look too. One is the church at the eastern end of Te Pito Te Henua road. This features a few remarkable oddities such as a decidedly Polynesian-looking carved Jesus and, when I was there (Christmas 2011) a nativity scene with painted Ranu-Raraku-style moai as the backdrop. Nearby, at the corner of Avenida Atamu Tekena is Plaza Policarpo Toro. Of the two busts sitting high on separate plinths in parallel one is of the eponymous naval officer who annexed the island for Chile in 1888. The other head is Atamu Tekena's – the Rapanui taken to be "king" by the Chileans at the time and who was coerced into handing them the island (a move whose legality is still contested). All in all, a trip to Easter Island is quite different to most other dark tourism ventures. The dark reason for the place's inclusion here, i.e. its blueprint warning of the dangers of the contemporary environmental destruction of the planet, remain rather abstract – but it's still a very powerful experience just being in this ultimate middle-of-nowhere spot. When viewing the moai you'll most likely be sharing the experience with "regular" tourists (if that category is applicable to Easter Island at all), but the awesome mystique of the place captivates everyone in the same way. It's a totally singular travel destination, and despite it being rather extravagant (and not cheap) I found it wholly worth it! Location: far, far away – from everything. It's not the most famously remote location for no reason. It's a whopping 1300 miles (over 2000 km) to even the "nearest" other inhabited island. That's Pitcairn, to the west, although this barely qualifies as inhabited … it has only about 50 permanent residents – in that respect it's an even more desolate place than Easter – and there are no transport connections between the two places. The "nearest" mainland is Chile, which is a full 2300 miles (3700 km) away to the east. The direct flight (by modern jet airliner) from Santiago de Chile takes about five hours – almost all of that over nothing but the empty expanse of the Pacific Ocean! We really are talking most extremely remote here! Access and costs: surprisingly easy, if flying in by plane from Chile, but not cheap. Details: Chile's national airline LAN offers the only easy and regular means of getting to Easter Island: there are at least two flights weekly, in high season (around December/January) even daily connections from Santiago de Chile; flight time is ca. five hours. Recently flights from/to Lima in Peru have added further to the accessibility of Easter. Tahiti is yet another destination that has flight connections with Easter Island. The only alternative to flying is going by boat, which naturally takes a long time (over a week from Valparaiso) and isn't as regularly possible (by quarterly supply ships that also take passengers). The only advantage would be that it could save money, though, because the flights to Easter Island aren't exactly cheap (up to 900 USD return). However, if you book other, especially international flights with LAN too, you can get significant discounts. And it's easy: their online booking website is the best I have ever encountered with regard to booking multi-stop flights (I booked a total of eight flights on one ticket with them when I went to Chile and Easter Island in December/January 2011/12). On the island, most visitors go on organized tours that take them to all the prime sights. There are several tour operators offering half-day and full-day tours in various combinations. Many can be pre-booked through international agents or locally at a hotel. It's all quite standardized and hassle-free. If you want to get away from tour groups and explore independently, and at greater leisure, you can do so e.g. by hiring a car – or a bicycle. The island is small enough to make the latter a viable alternative, provided you're fit enough. Horseback riding is another popular means of transport – and one that can get visitors to otherwise quite inaccessible parts of the island. Note that access to the national park of Rapa Nui costs a 60 USD fee payable on first entering – regardless of whether by tour group or independently – but it remains valid for multiple entry even on subsequent days (so keep the ticket secure if you're planning to split visits over two or more days!). Accommodation options cover quite a range – from a couple of luxury lodges at the top end, via a number of good mid-range hotels to several cheap hostels. Finding places to eat out in is also easy – and can be great fun. The culinary influence of Polynesia is more prevalent than that of Chile and the wide ocean around the island supplies plenty of fish, including top-quality Ahi tuna (for the time being at least –even out here overfishing is an issue, just like everywhere else). All hotels and restaurants, just like virtually all infrastructure, are located in or on the edge of Hanga Roa, the island's only village. This village is small enough to explore on foot – although there are now a couple of taxi services too. Time required: you can see all the major sites in as little as two days – only those who want to dig deeper, figuratively speaking (archaeologists excepted, who may also physically dig), would want much longer than that. That's unless you prefer to take things slowly and independently, e.g. by exploring on horseback or bicycle, which is obviously more time-consuming. Combinations with other dark destinations: None in the vicinity – as in: really absolutely nothing at all, dark or otherwise. The only practical combination is with Chile. Theoretically the Marquesas, located a similar distance away from Easter Island but in a north-western direction, could be an option too – although you'd have to fly via Tahiti, which is quite a detour, and certainly not a cheap and easy option. Combinations with non-dark destinations: Easter Island is hardly a prototypical Polynesian island, i.e. it's no tropical paradise, but a rather barren and rugged piece of rock in the ocean, and the climate is somewhat less of the year-round-summer bliss normally associated with Polynesia. But: Easter Island does have a single white sand beach (at Anakena – see above) where even palm trees have been replanted to make it look more like what you'd expect of a tropical island. Surfers enjoy the Pacific swell too. Inland, horseback riding is the main activity. Still, most people come out of archaeological/historical interest – or simply because you can so easily get to this most famously remote spot.